Lutana is a suburb of Hobart, Tasmania, Australia. It is part of the City of Glenorchy. 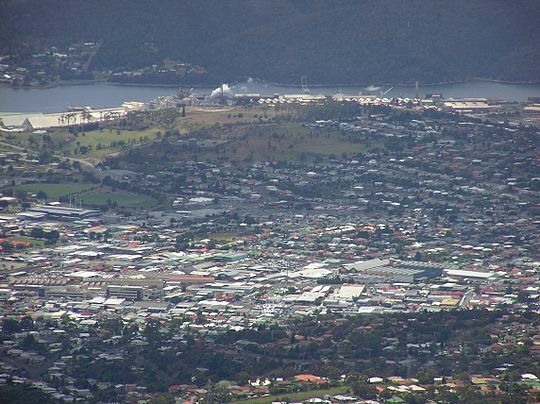 It is a large residential suburb located between the Brooker Highway and the River Derwent. It was originally built by the Electrolytic Zinc company (the then operator of the Zinc works)  as homes for its employees at the nearby zinc works. Lutana is the aboriginal word for moon. The homes were later sold off and are now privately owned. The zinc works at Lutana, is the largest exporter in Tasmania, generating 2.5% of the state's GDP. It produces over 250000 tons of zinc per year. ^ Australian Bureau of Statistics (27 June 2017). "Lutana (State Suburb)". 2016 Census QuickStats. Retrieved 14 April 2018. ^ Ruth Barton. "Communal life, common interests and healthy conditions". ^ "The Zinc Works". TChange. Retrieved 11 July 2009.